Need to Dismiss A Ticket? Course is Fun, Fast, Easy and 100% Video. Texas State Approved by All Courts. Login & Logout Anytime Anywhere. If you’ve even been issued a speeding ticket, you know the importance of wiping that offense off your record. One option is defensive driving, which can be used to dismiss your traffic ticket and keep your clean driving record intact. But some defensive driving classes in Dallas, TX, can be expensive and difficult to attend. Not anymore with Funny Bone Defensive Driving School, the best Dallas defensive driving online course. Our classes don’t require you to sit through boring lectures. Instead, our course is fun, easy to use and can be accessed through an app on your phone. Interested in learning more about how we’re changing the defensive driving course game? Check us out today. Do I Need a Dallas Defensive Driving Course? Getting slapped with a speeding ticket doesn’t require going to defensive driving, but it may help you avoid some unwanted consequences. Instead of taking a Dallas defensive driving course, you could take your ticket to court and hope you can get it dropped. Or you could pay the whole fine, which can both cost a fortune and leave a black mark on your record. Our question is: Why would you bother with either of those options? Our defensive driving school in Dallas, TX, will help you avoid trying your luck in court and will strike that ticket off your record for good. Don’t be a sucker and talk yourself out of a program that you can complete in your own time at home on your smart phone. Better yet, you can also avoid a hit to your car insurance rate. It’s a win-win! Contact Funny Bone Defensive Driving School and forget that ticket ever happened. When we tell you that other defensive driving courses are put-you-to-sleep boring, it’s not an overstatement. Many folks out there avoid taking a Dallas defensive driving course because they require you to be in class at specific hours and are an absolute bore to sit through. But with Funny Bone’s online courses, you can complete your course in your pajamas without ever leaving the couch! Our mobile format allows you to take your course with you wherever you go, avoiding the unneeded hassle of sitting in a dingy classroom with a bunch of people you don’t know. Our course will take just six continuous hours over a 90-day timeframe to complete. Commit to the future of defensive driving in Dallas, Texas, today! At Funny Bone, we know that no one wants to sit through a defensive driving program. That’s why we have built our Dallas online courses to actually be fun and entertaining. That may be hard to believe, admittedly, but our staff really has committed to making your six-hour commitment fly by with interactive and entertaining content. You no longer have to worry about an instructor who sounds like your fifth-grade math teacher. With our online format, we are focused on giving you the absolute easiest possible defensive driving experience you can find anywhere with our courses. If you don’t believe us, contact us today to find out more! 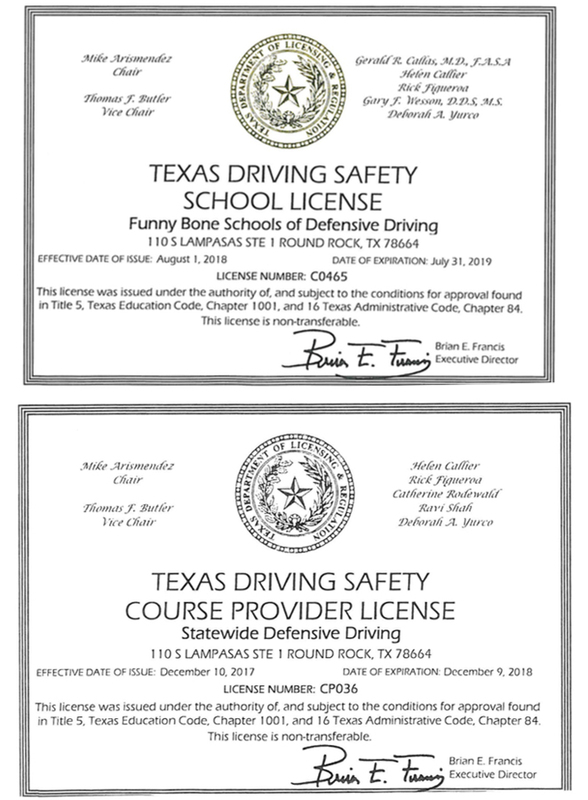 That may seem hard to believe, but the folks at funnybone didn’t see a reason why taking defensive driving should be equated with pulling teeth. Our content is entertaining and interactive. You will be through before you know it. We’ve already focused on our online accessibility, but Funny Bone also wants to give you maximum compatibility for your phone, tablet or desktop computer. We are all about convenience here at Funny Bone, which means we won’t even make you sit at your desk if you don’t want to. Pull up our Dallas defensive driving course online from your bed, sofa, toilet or neighborhood coffee shop and get to work right away! When we say that we are obsessed with the best customer experience, we truly mean it. We will order your driving history for you, making sure that you stay away from your local DPS office at all costs. That place is terrible, right? Once you’ve completed your course, we offer overnight delivery of all certifications so you can get your ticket dismissed ASAP without having more bureaucracy to wade through. If you want to know how you can complete your defensive driving course in Dallas, Texas, on your own terms, reach out to our team today! Complete a fun and easy to use AP from your phone on your schedule? We think so too. 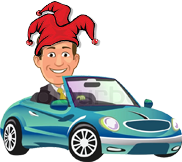 Funnybone is your number one option for defensive driving in Dallas and we want to help you make the obvious choice. Why do you need to complete a Dallas defensive driving course? Well, let’s break down your options. When you get slapped with that ticket, all potty jokes aside, you can do one of three things with it. Go ahead and schedule that court date and keep your fingers crossed that you can get it dropped. You could pay the fine which, in addition to taking money from your pocket, also puts a big ol mark on your record. Or you could do the smart thing and enroll in an online defensive driving program, have your ticket dropped and enjoy a nice tasty reduction in your insurance rate. Tough decision? Work at your own pace! We get it, you’re busy! You have your own schedule to keep and it probably doesn’t allow for lecture time. However, maybe you have a longer lunch break on Wednesday’s? Maybe you need something to do while you wait for your kid to get out of ballet class? Funnybone’s mobile format lets you take advantage of those moments! It takes only 6 hours over a 90 day period to complete. Our online program is actually fun! Choose your weapon. Desktop, laptop, mobile device. Funnybone decided that if we were going to be all about convenience, we needed to offer you the ability to use all your devices interchangeably to complete our program. This means you can take a break with it at work, curl up with your tablet on the couch at home, or even plug away at it using your phone while you wait for your kid to get out of tap dance. Don’t even bother standing in line at the DPS to request your driving history. We’ll order a report for you. We offer overnight delivery on all certificates of course completion and our outstanding customer service is ready to assist you seven days a week. Our bottom line here is fun and convenience. Everyone should be able to enjoy the benefits of defensive driving. Enroll with Funnybone today and do it on your own terms, and on your own time!